Hello internets, long time no see! I do actually have a large backlog of entries about gigs, jewellery and general goings on, but the backlog got even more backed up as time went on and I couldn’t be bothered to sort through it all. I’ll attempt to get up to speed over the next few weeks. So, what’s new? The website design for one. I gave it a newer, more streamlined feel and also merged in my flickr feed as I felt it was stupid to upload my photo portfolio into two separate places. I also now have a real live home page, with flashy banners, scrolling photo tickers, social widgets and a little box that shows my weekly most played album from last.fm (which I hand coded myself, are you proud mum?). I still haven’t got a proper online shop back up yet, due to me battling to get Magento installed on my server and then trying to figure out how it works. But Folksy and Etsy are doing ok for the moment, and I have all my stock listed on them so nothing is missing. Jewellery wise, there have been lots of new bits over the past few months, including a Supernatural themed Impala necklace which manages to sell out as soon as I receive a new batch. 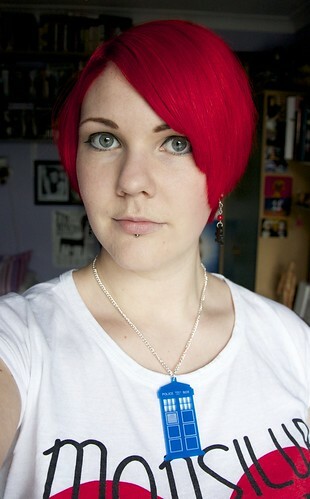 I also redesigned the TARDIS necklaces to match the canvas bags, and I’ve been pressing on with screen printing things. Gigs; there have been plenty, and photography has temporarily ground to a halt as I’m not happy with how GigJunkie are operating these days. The only gigs I’ve managed to pro-shoot have been small ones or for friends. Fingers crossed I can get back into that soon. So sit back, enjoy, and please keep checking in as the entries below should start to appear.